I am in that stage of life where all of my good friends are getting married. I have stood up as a bridesmaid in handfuls of wedding parties and been to dozens of weddings as a guest. Besides all of this I have made a countless wedding cakes for the most outstanding clients in the city! My point is: I'M SURROUNDED BY WEDDINGS! It’s a good thing I enjoy them so much! There are elements that have stood out in each one, delicious BBQ buffet style dinners, a party trolley cruising around downtown, adorable matching robes for the bridesmaids… ya know, your standard stuff. But what if you don’t want standard?! What if you want OUTSTANDING? How do you stand out in a sea of weddings that all feel the same?...Make it about you! Include elements that represent you and no one else! Use touches that capture and encompass YOUR style and personality! With my artistic brain I always turn to the custom and creative route. These vendors are providing unique, creative, skillful and CUSTOM touches that your guests will have NEVER seen before because they will be ALL YOU. Little Fox Paperie is a custom wedding stationery company specializing in custom illustrations. In addition to the wedding stationery services, owner Gracie Nunez is creating custom artwork for the home. 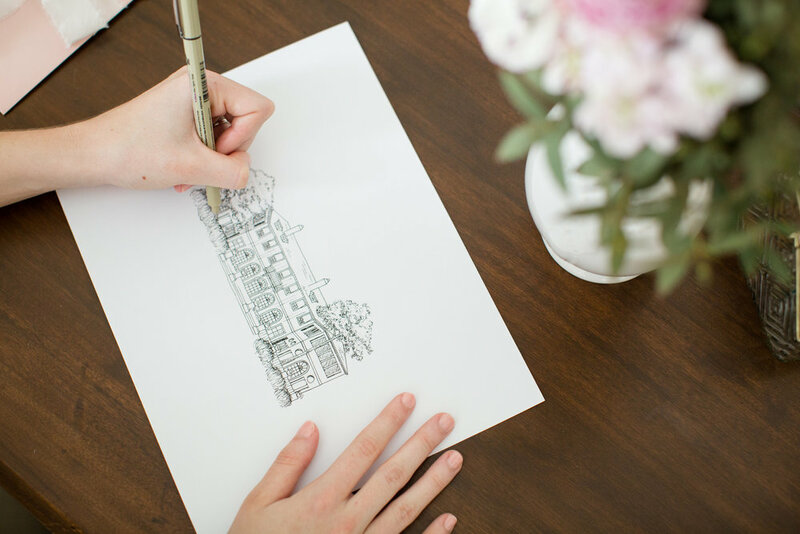 These art pieces include floral illustrations, wedding venue sketches, and maps to your venue. Each illustration is drawn by hand to suit your needs. What a perfect way to demonstrate details that are totally unique to you. Want to incorporate your pupper or your wedding decal in creative ways? Erin Martin (That’s me! ), owner of ECBG Cake Studio, is making custom decorated sugar cookies to capture your personality on your big day. Get them bagged with a bow for a perfect take away gift for your guests. Are flowers not your thing, or do you want a big and colorful impact? BALLOONS BABY! Incorporate your wedding colors and show off your fun side. Gromeza Design is a Chicago-based boutique, creating memorable events through custom balloon installations, on-site event decor and styling services, and floral design. Anyone that has been in a wedding party knows the day of is a strange mix of very busy and waiting around, and it’s an all day affair. Sometimes someone orders subs, sometimes there are mimosas, sometimes the food and drink situation has been over looked all together- which is tragedy if you ask me- in multiple ways! DON’T FORGET TO FEED YOUR GALS! But y'all feed them in the cutest way with the exquisite tea party service of Kith + Kin. Owner Romy provides nibbles, boozy sips, and the best of the best tea. If that isn’t a Pinterest worthy moment I don’t know what is! Romy Pereira is a third-generation tea entrepreneur with a passion for tea, food and service. She brings 12+ years of experience in food, fine dining and tea to the table to create the most beautiful celebrations and valuable experiences. The only thing that will truly set your wedding apart from anyone else's is YOU. Incorporate touches that light you up and encompass your personality!